Parenting Tips - Everything from a review of schooling to activities for the kids. As a professional speaker, many businesses ask me to help their employees be more creative on the job. It seemed natural to try to incorporate creativity in children when they are young, so they can have that important skill as they grow up. A creative person is also confident...they know they can look at a problem from several different angles. A creative four year old that needs orange paint, (but doesn't have any) gains confidence when they try to mix other colors to get the orange shade they want. Creative adults know they can come up with ways to deal with a difficult co-worker or solve a work related problem instead of throwing up their hands and saying, "I can't do it!" We adopted our oldest daughter when she was 8. We knew we would have to put out extra effort to try and help her overcome the deprivation of her early years of life. This meant really thinking about our role as parents, instead of just reacting to every situation that happened. We also decided she needed a "fun" atmosphere at home. People saw the fun (and crazy) things we did and said, "I wish I could be more creative with my children." I wrote the book to show how easy it is to add humor and creativity to a family. On page 42 I descibe the solution my husband and I came up with when my three year old cried as I left for a speaking engagement. Instead of telling her I would bring her back a new toy, my husband came up with a novel idea. When I told Sondra I needed to leave for a day or two, that was the time she and Dad could plan what type of costume they would wear to pick me up at the airport. For several years I was greeted at the airport by characters ranging from Captain Hook to Phantom of the Opera. It showed Sondra there are creative ways in dealing with a problem. We turned a "sad" situation into a positive one. We get so caught up in schedules and homework and discipline we forget to just have fun. If you have lots of errands to run, take ten minutes to stop at a park. If you watch TV together do jumping jacks during every commercial. I've worked with at risk teens and found by being creative and incorporating fun into the rules, I had very few discipline problems. "Your daughter also has her own book.� Tell our readers how her book come about and about some of the crafts in her book." Sondra is eight and saw me writing numerous books so she decided to write one also. I told her the main rule of writing is to write about a subject you enjoy. She's been making crafts all her life, so that is the topic she choose. She made all 55 craft samples, made comments about each one and then dictated to me the supplies needed, and what steps to take to create the craft. She also wrote to several people to get endorsements. Jack Canfield from the Chicken Soup books and Dave Thomas from Wendy's hamburgers both sent her endorsements. Sometimes I think parents are so worried about disciplining their children they forget to enjoy them. I've seen parents worry that their toddler will be a gang member because the 2 year old pushed another child on the playground. Discipline is important, along with consistency. Yet if the general atmosphere in the house is one where people respect each other, much of the discipline naturally falls in place. As parents, we have to be role models. If our children see us snapping at them or being rude to a store clerk, that's what children will do. I love watching families at airports. You'll see parents yell at their children to sit still in the waiting area. Then when a child wants to get up and walk around, the parents get frustrated because threir child is "wild". Then I watch parents that let their children ride the moving walkways over and over again while waiting for therir flight. Those parents don't have to yell, because they are busy interacting positively with their children. Then when its time to board the plane, these parents tell their children,"We had fun moving around at the airport. Now it's time to sit quietly on the plane and color in your new coloring book. Then when the plane lands you can move around again" Let's face it, parenting is labor intensive! I taught pre-school for 5 years and ran family activity programs for ten years. Frequently I sponsored an activity that had 50 families participating. Because I kept everyone involved and interacting, I seldom, (if ever) had any discipline problems. When children feel they have some control in a situation and feel like their ideas are respecvted, they channel their energy in a positive direction. I'm working on a book called, "Have You Given Your Child A Standing Ovation Today?" Its full of simple ways to let children know you think they are special. Sondra and I were both just on the 700 Club discussing our books. I also got calls from the producers of Martha Stewart Show, Howie Mandel and Rosie to discuss having Sondra talk about her book on their shows. So I guess I'll have to follow in her footsteps for awhile! Read some more about her wonderful book at Amazon! 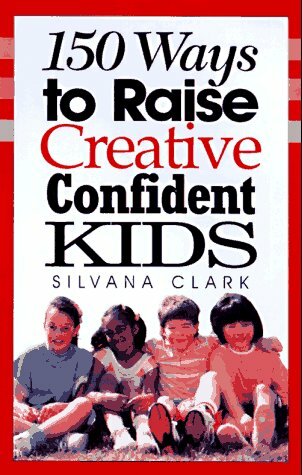 Full of great ideas on child rearing and children's projects. Check out this wonderful craft book at Amazon!